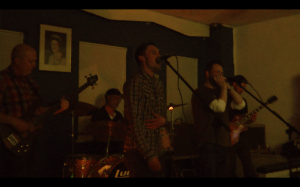 Ben Watson, The 78s and Spanish Battery rocked the opening weekend of the Jesmond Community Festival with lively sets at a blues night in the British Legion Club. The acts entertained the audience with a variety of roots music, ranging from traditional and acoustic blues to blues-rock and Americana. All proceeds from the event went towards Jesmond Oxfam Books and Music’s Trailtrekker team, who are walking 100km in 30 hours around the Yorkshire Dales for charity on 26th May. 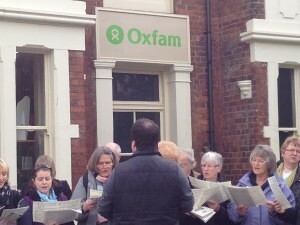 Jesmond shoppers were greeted with an unexpected musical treat on Saturday morning (21st April) when a “flash mob” choir serenaded passers-by outside Oxfam, Waitrose and Pizza Express. The purpose of this performance was to raise awareness for the upcoming Jesmond Community Festival, providing a taste of the various events running from 27th April to 14th May. Those who participated in Saturday’s musical performance, organised by conductor Jonathan Scott, came from a number of different choirs in the north east, including the Jesmond Choral Group and the Tynemouth Priory Singers. Festival attendees can expect to hear more from these choirs during a performance of Dvorak’s Requiem on 3th0 April, which will also be conducted by Scott. This is the first year a musical “flash mob” has been performed before the community festival. For more information on the festival, please visit www.jesmondfestival.org.uk or have a look on our own festival page here.